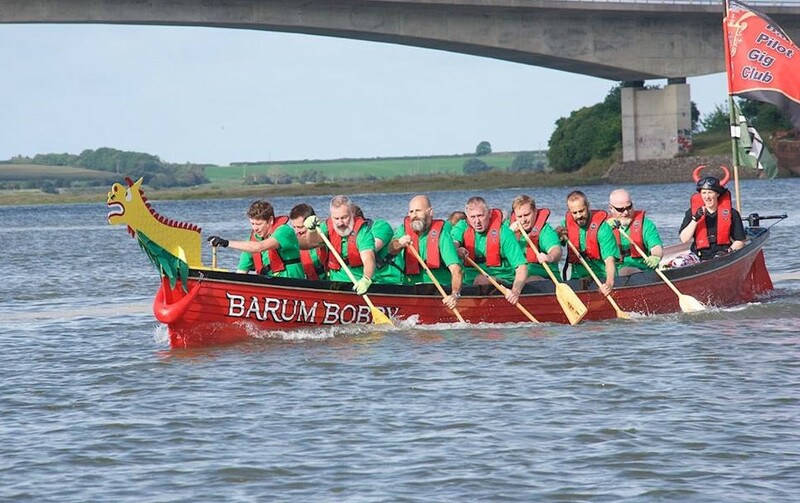 Barnstaple Pilot Gig Club held their second Dragon Boat Racing Festival last Saturday, with four gig boats decorated as Dragon Boats and eight crews of 12 paddlers competing for the BPGC Dragon Boat Trophy (kindly donated by Kevin Ward). The 96 competitors gathered on Castle Quay slipway from 8.00am to register and prepare the boats, and the first race started at 9.30am. 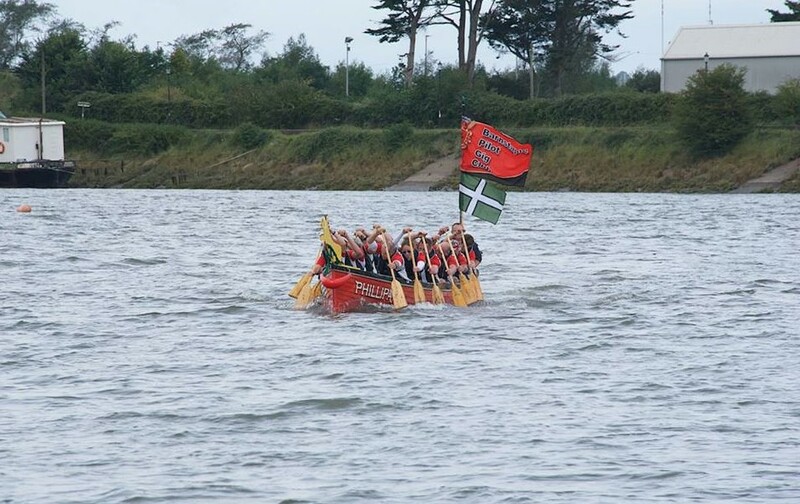 The boats had splendid Dragon’s heads on the bows of the red and black Phillipa J and Barum Bobby (both BPGC boats), the white gig Siren (on loan from Appledore gig club) and the blue boat Giggles (on loan from Torridge gig club), and all were coxed by BPGC coxswains. The first race was between crews from Parker Hannifin and Ilfracombe Gig Club, and both had a tough time getting to the starting line (entrance to the River Yeo) against the racing incoming tide. However, once they turned and lined-up together for the starter to set them off, they speeded towards the finish line (Queen Anne’s statue) for a convincing win by Parker Hannifin. The tide eased off for the subsequent races between a BPGC crew and Trailblazer Daredevils, St Georges Dragons and the Windsor Arms, and Exe-Calibre and Fremington Trailblazers. Semi-final races followed for the winners of the first four races; Parker Hannifin took on Trailblazer Daredevils for a win by Parker’s, and the Windsor Arms had a good start and an early lead in their semi-final against Exe-Calibre, only to be overtaken before the finish line. There was still sufficient water after the final race to allow two consolation races between Ilfracombe and BPGC, and Fremington Trailblazers and St George’s Dragons. These were won by Ilfracombe and Fremington Trailblazers respectively. Exe-Calibre were a visiting crew from Exeter where they practise Dragon Boat racing on the river Exe and Exeter canal. 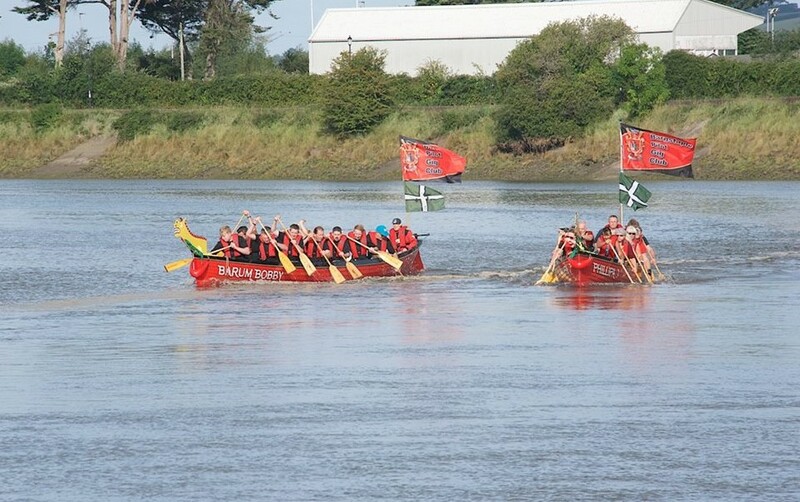 They will be invited back for the next Barnstaple Dragon Boat Racing Festival next Spring.